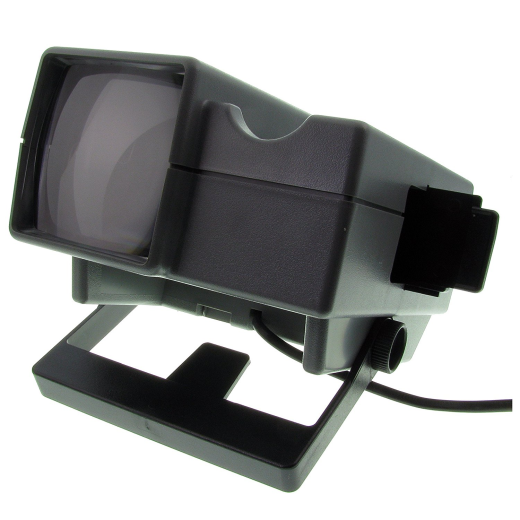 An excellent quality desktop slide viewer. Supplied with fitted UK plug for 240v mains operation. It also comes with a battery holder and bulb unit if you want to use it with batteries (2 x C size - batteries not included). The unit has an adjustable stand and a high quality magnified 75mm x 75mm viewing screen. It can hold a large number of 35mm slides. Each slide is automatically loaded and then ejected by using the manual mechanism. It is designed to be used with the modern plastic framed 35mm slides but can also be used with the older cardboard framed slides from the 1960s if you are careful with the mechanism.